First of all, on behalf of Giving Back Association, I would like to express my sincere gratitude to M.R. 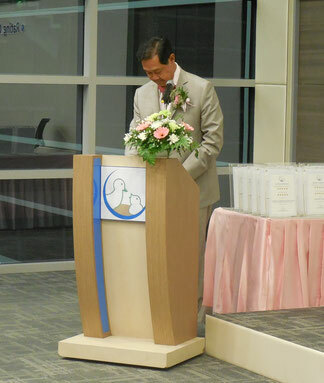 Pridiyathorn Devakula, the former Deputy Prime Minister of Thailand who presided over "The Giving Back Rating Certificate Awards" which was held on last Friday July 8th, 2016 at auditorium of HANA Microelectronics PCL, Bangkok. There were 60 representatives of 24 charitable organizations that participated in the ceremony. 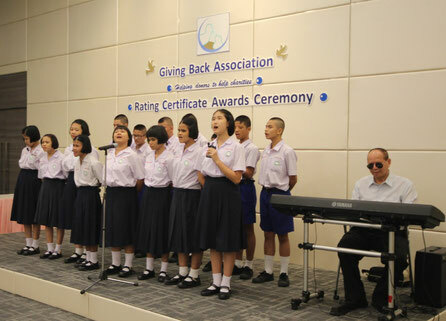 The participants enjoyed and were impressed with the abilities of the Blind Folk Song Band from the Christian foundation for the Blind in Thailand under the Royal Patronage of H.M. the King and the Blind Chorus Singers from Foundation for the Blind in Thailand under the Royal Patronage of H.M.the Queen. Thank again, to 24 charitable organizations who attended the ceremony on the day. It made me think to myself .... "What a wonderful World"
On the top standing row, the fifth from left, M.R.Pridiyathorn Devakula, the former Deputy Prime Minister presided over the "GBA Rating Certificate Awards" and Mr. Terry Weir, GBA Founder standing on the next. The ceremony was held on Friday 8th, July 2016 at auditorium of HANA Microelectronics PCL, Bangkok. 8. Mr. Kevin J. Beauvais, the Chairman of Operation Smile. ขอขอบพระคุณมา ณ ที่นี้อีกครั้ง สำหรับ ผู้แทนองค์กรการกุศลทั้ง 24 องค์กรที่ได้เข้าร่วมงานในครั้งนี้ ซึ่งทำให้ผมคิดคำนึงกับตนเองว่า "โลกช่างสวยสดงดงามอะไรเช่นนี้"
คณะนักร้องเด็กนักเรียนพิการทางสายตากำลังขับร้องเพลง "What a wonderful World"